1880 United States. Census Office. 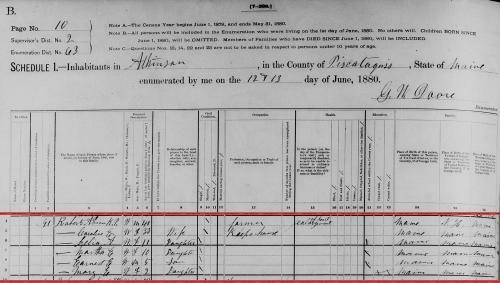 10th census, 1880 federal population census, Washington, District of Columbia: National Archives and Records Service, ([19--]) , Census Place: Bradford, Penobscot, Maine; Roll: 485; Family History Film: 1254485; Page: 444B; Enumeration District: 007; Image: 0151. Donald Lines Jacobus, History and Genealogy of the Families of Old Fairfield, Baltimore, Maryland: Genealogical Publishing Co., (1930, 2007) , pp. 503-504. Royal Ralph Hinman, A catalogue of the names of the early Puritan settlers of the colony of Connecticut: with the time of their arrival in the country and colony, their standing in society, place of residence, condition in life, where from, business, &c., as far as is found on record, , at https://books.google.com/books?id=KTkBAAAAYAAJ . Hartford: Press of Case, Tiffany and Company, (1852) , p. 864. 1880 United States. Census Office. 10th census, 1880 federal population census, Washington, District of Columbia: National Archives and Records Service, ([19--]) , Census Place: Atkinson, Piscataquis, Maine; Roll: 487; Family History Film: 1254487; Page: 70B; Enumeration District: 063; Image: 0142. 1900 United States. Census Office. 12th census, 1900 population census schedules, Washington, District of Columbia: Bureau of the Census Micro-Film Laboratory, ([197-]) , Census Place: Garland, Penobscot, Maine; Roll: 598; Page: 1B; Enumeration District: 0103; FHL microfilm: 1240598. "Maine, Vital Records, 1670-1907 ", index and images, FamilySearch (https://familysearch.org/pal:/MM9.1.1/KCDL-D1B : accessed 10 March 2015), Aubury A Skillin, 1894. 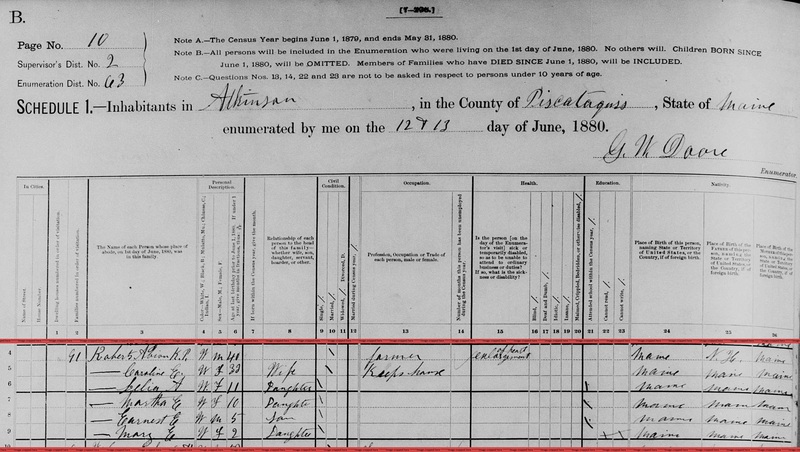 "United States Census, 1880," database with images, FamilySearch (https://familysearch.org/ark:/61903/1:1:MFQS-MHW : 14 July 2016), Abion K P Roberts, Atkinson, Piscataquis, Maine, United States; citing enumeration district ED 63, sheet 70B, NARA microfilm publication T9 (Washington D.C.: National Archives and Records Administration, n.d.), roll 0487; FHL microfilm 1,254,487. "United States Census, 1930," database with images, FamilySearch (https://familysearch.org/pal:/MM9.3.1/TH-1951-22731-3439-40?cc=1810731 : 8 December 2015), Maine > Penobscot > Garland > ED 47 > image 3 of 14; citing NARA microfilm publication T626 (Washington D.C.: National Archives and Records Administration, 2002). 1910 United States. Bureau of the Census. 13th census, 1910 population census schedules, Washington, District of Columbia: Bureau of Census Micro-Film Lab, ([19--?]) , Census Place: Garland, Penobscot, Maine; Roll: T624_544; Page: 2B; Enumeration District: 0170; FHL microfilm: 1374557. "United States Census, 1930," database with images, FamilySearch (https://familysearch.org/ark:/61903/1:1:XMD7-KSY : accessed 29 November 2016), Ora C Roberts, Bradford, Penobscot, Maine, United States; citing enumeration district (ED) ED 21, sheet 6A, line 24, family 128, NARA microfilm publication T626 (Washington D.C.: National Archives and Records Administration, 2002), roll 837; FHL microfilm 2,340,572. 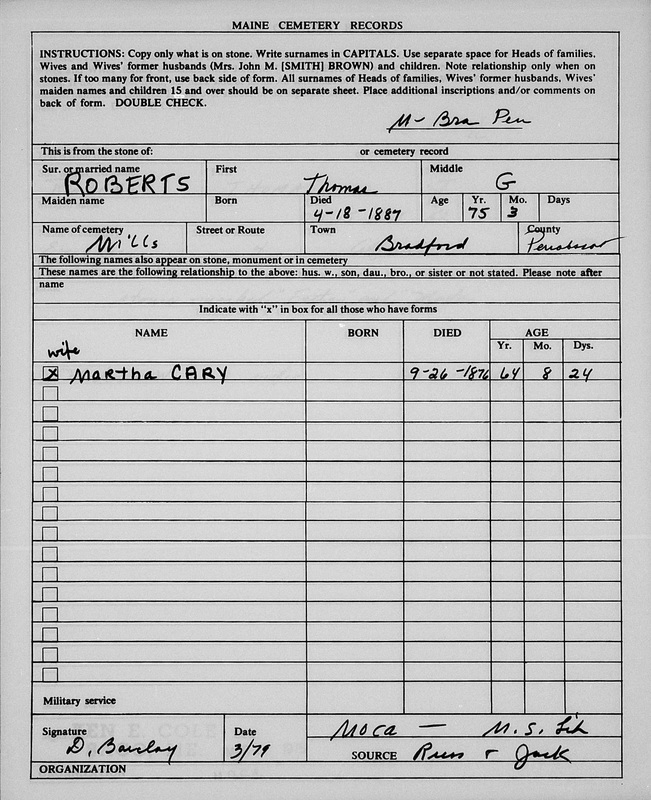 "United States Registers of Enlistments in the U.S. Army, 1798-1914," database with images, FamilySearch (https://familysearch.org/ark:/61903/1:1:VRQC-LCB : 4 December 2014), Mark A Roberts, 20 May 1862; citing p. 39, volume 57, Banger, , Maine, United States, NARA microfilm publication M233 (Washington D.C.: National Archives and Records Administration, n.d.), roll 28; FHL microfilm 350,334. 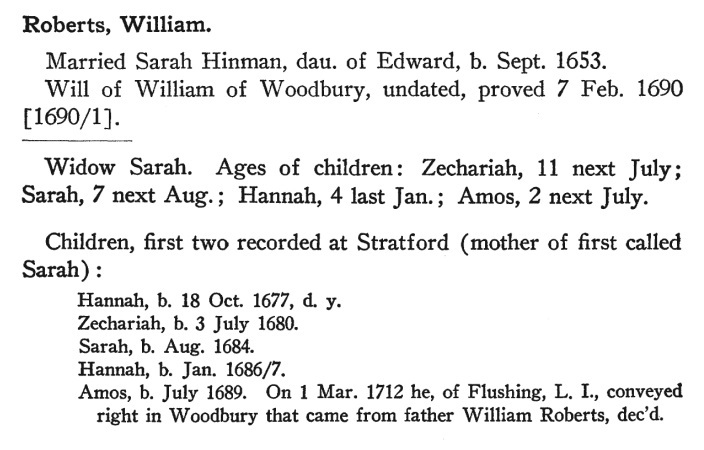 "Maine Births and Christenings, 1739-1900," database, FamilySearch (https://familysearch.org/ark:/61903/1:1:F4C5-DVH : 4 December 2014), Martha A. Roberts, 11 Feb 1870; citing BRADFORD, PENOBSCOT, MAINE; FHL microfilm 10,579. "Maine Births and Christenings, 1739-1900," database, FamilySearch (https://familysearch.org/ark:/61903/1:1:FWBS-RX1 : 4 December 2014), Louis A. Burnham, 12 Jan 1894; citing Garland, Penobscot, Maine; FHL microfilm 10,830. 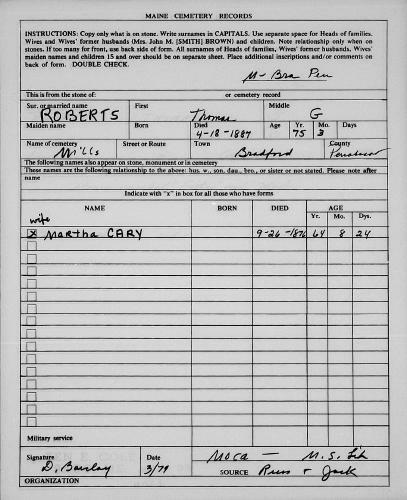 "Maine Vital Records, 1670-1921", database with images, FamilySearch (https://familysearch.org/ark:/61903/1:1:VZ3F-LK7 : 27 December 2014), Martha E Burnham, 1900. "Maine, Marriage Index, 1892-1966, 1977-1996," database, FamilySearch (https://familysearch.org/ark:/61903/1:1:KCN1-BP3 : 27 November 2014), Ora C Roberts and Lillian V Arnold, 28 Mar 1915; citing Marriage, Maine, United States, State Archives, Augusta. "Maine Vital Records, 1670-1921", database with images, FamilySearch (https://familysearch.org/ark:/61903/1:1:Q24J-MW3L : 6 October 2016), Barbara Helen Roberts, 1919. 1900 United States. Census Office. 12th census, 1900 population census schedules, Washington, District of Columbia: Bureau of the Census Micro-Film Laboratory, ([197-]) , Census Place: Garland, Penobscot, Maine; Roll: 598; Page: 8A; Enumeration District: 0103; FHL microfilm: 1240598. "Maine Births and Christenings, 1739-1900," database, FamilySearch (https://familysearch.org/ark:/61903/1:1:FWBS-YYC : 4 December 2014), Sylvester M. Roberts, 25 Dec 1882; citing Garland, Penobscot, Maine; FHL microfilm 10,830. "Maine, Nathan Hale Cemetery Collection, ca. 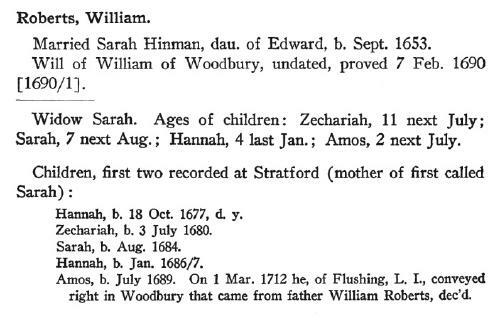 1780-1980," index and images, FamilySearch (https://familysearch.org/pal:/MM9.1.1/QVJP-1TZ9 : accessed 5 March 2015), Thomas G Roberts, 1887; citing Bradford, Penobscot, Maine, United States, Mills Cemetery, Maine State Library, Augusta; FHL microfilm 1,316,208. "Maine, Marriages, 1771-1907," index, FamilySearch (https://familysearch.org/pal:/MM9.1.1/F4XT-VXW : accessed 5 March 2015), Thomas G. Roberts and Martha Curey, 05 May 1834; citing Bangor, Penobscot, Maine, reference ; FHL microfilm 10,584.